As concerned citizens from around the world, we call on you to immediately take a stronger stance toward the Egyptian military and characterize President Morsi’s removal as a coup. The bloody crackdown in Cairo has left hundreds dead -- we urge you to suspend the $1.3 billion in annual military aid until the violence stops. 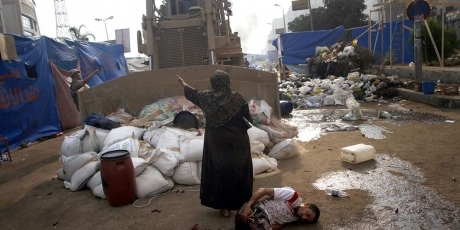 It's Tiananmen square all over again -- Egypt's army-led government has ordered police onto the streets to use lethal force against civilians and now hundreds are dead and thousands more injured. And yet incredibly the United States -- who pay the Egyptian army’s bills -- is in denial, continuing to send billions to the army while they massacre innocent protesters. But there’s a powerful clause in US law which could stop the flow of cash. They’re not allowed to keep sending money to the army if the President determines their grab for power amounts to a coup. So far Obama has avoided stating the obvious to keep the generals on-side, but with blood flowing freely on the streets of Cairo let’s get him to see the writing on the wall and stop funding the killers. Call on Obama right now to end the funding until the bloodshed stops and democracy restored. After months of spying revelations, he’s looking for a way to repair relations and our voices carry extra weight. Click here to sign this urgent petition right now and we’ll deliver it directly to the White House when we reach 1 million signatures.